For 11 minutes on Thursday night, when President Trump’s Twitter account was unexpectedly disabled, Twitter went into panic mode. At the company, customer service representatives, public relations managers and executives — including Twitter’s chief executive, Jack Dorsey — were bombarded by people asking what had happened to the president’s account, which Mr. Trump regularly uses as a megaphone for all manner of matters. No one had answers, according to current and former Twitter employees who were involved or briefed on the situation, and who spoke on the condition of anonymity because the details were private. Mr. Trump’s Twitter account was quickly restored, but the internal scramble continued. Initially, Twitter executives believed the action had been an accident by an employee. Mr. Dorsey pushed for transparency, said one of the people with knowledge of the matter, and the company put out a statement to that effect. Only after further review did executives discover that it was a contractor who was leaving Twitter that day who had disabled Mr. Trump’s account, said the people involved in the matter. The incident immediately made the unnamed contractor a hero to some and a villain to others for muting, even temporarily, Mr. Trump. Yet the outcome for Twitter was black and white: It was another fiasco that the social media company had to clean up. 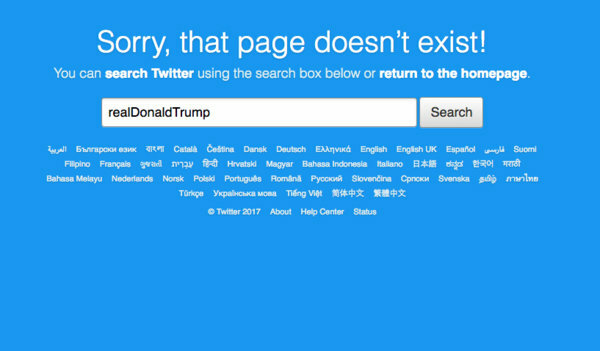 President Trump’s Twitter account was briefly disabled Thursday night. Twitter later blamed a company employee on his last day of work. The temporary deletion of Mr. Trump’s account capped an already rough week for Twitter, which has been under scrutiny for online abuse and how its service can be misused. On Tuesday and Wednesday, Twitter had appeared at congressional hearings in Washington, where lawmakers grilled the company — along with Google and Facebook — for their roles in spreading divisive messages ahead of the 2016 election. At the time, Twitter had pledged that it would take on more security measures. Yet Mr. Trump’s deleted account showed how empty some of those promises seemed. Late Thursday, Twitter employees gathered in private Slack channels and used Twitter to send direct messages to one another to remark on how insecure Mr. Trump’s account had been, according to people involved in the conversations. Hundreds of employees can access the accounts of so-called Very Important Tweeters and can take actions like disabling the accounts, according to the current and former employees. A Twitter spokeswoman referred to the company’s earlier remarks, noting it was conducting an internal investigation into the matter. On Friday, the company tweeted that it had added new safeguards to prevent a repeat of the incident, and said it would not be able to share all the details of its investigation. Mr. Trump, for his part, remarked that the incident reflected the impact his Twitter messages have had. He tweeted with gusto on Friday, firing off more than a dozen messages over the course of the day on issues including ISIS and Hillary Clinton. The discovery that it was a contractor who deleted Mr. Trump’s account is difficult for Twitter, as well as other technology companies. Nearly every major technology company including Google, Facebook and Apple relies on contract employees to fill positions. In general, the jobs tend to be nontechnical roles such as customer support or administrative and operational positions. Many of these workers are brought on by staffing companies like Accenture, Adecco and Cognizant and work on renewable one-year contracts. Facebook, Twitter and other companies also outsource content review to third-party services like ProUnlimited and Cognizant, which are essentially internet call centers staffed with hundreds of workers who deal with customer service issues. But in a conference call with investors on Wednesday, Facebook said many of the new workers are not likely to be full-time employees; the company will largely rely on third-party contractors. At Twitter, employees have long expressed concern about the widely available nature of internal tools for handling customer accounts. Disabling an account is typically an easy two- or three-step process, according to current and former Twitter employees. Certain teams at the company — including trust and safety, and operations — have access to all accounts including the highest levels. Twitter customer support cannot, however, access customers’ private direct messages, nor can it tweet on behalf of other users, these people said. In the end, the company did not follow through with the plans, these people said. On Friday, Mr. Dorsey tweeted that Twitter was clarifying its rules around what was or was not acceptable on the service. The chief executive sidestepped putting up his own post about President Trump’s missing-then-found account. In the past, Twitter has discussed adding additional layers of security that would prohibit wide internal access to V.I.T. accounts, according to these people. That included a kind of “dual layer” of security, requiring assurances from multiple employees to make significant changes to accounts.